The composting site at the allotments, on Approach Road (map below), is open every Saturday from 10am to 12 noon. The site will open to the public on the first Saturday in April for the receipt of green waste from the village. Donations for the Compost will remain the same £1.25 a bag or £2.50 a wheelbarrow load. Another composting season will soon be upon us! During the month of March the team will be on site getting things ready to accept green waste from villagers starting Saturday 6th April. We should, by then, have finished rebuilding thirteen old composting bins with new timber. If we achieve this, we will be on target to have completely renovated the site by spring 2020, although this does depend on funds being available to buy the timber. 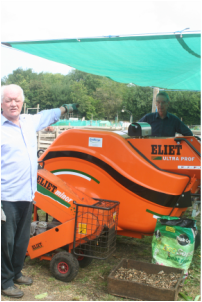 On the subject of money, we received a grant of £5,500 from The Community Fund for Surrey to go towards the purchase of a second shredder. This was great news but it was £1,500 less than they originally indicated they could find for us. We have to go ahead and buy the shredder before the end of April or we lose this grant and the £3,000 grant from the National Lottery. Obviously, we don’t want to lose this money, especially after all the work applying for these grants involves. The Parish Council have kindly allowed us to divert money they had generously promised us for new timber but we will still be dipping quite deeply into our reserves, something we try to avoid given how expensive unexpected repairs to our machines can be. Should you wish, you can help us with our finances by buying our lovely, locally produced compost, supporting us via the Tandridge Lottery (you can find us by Googling “Tandridge Lottery Tatsfield Composting”) or you could always consider making a donation directly to us. On more mundane matters, I am going to be a bit more specific about the quantity of waste people can bring up to us this year. In the past, we have asked people to let us know in advance if they have a “large quantity”. This obviously means different things to different people so I am going to say up to a large builder’s bag or the equivalent in smaller bags is fine but please call me in advance if you wish to bring up a larger load. I am going to finish this month by including a quote from the report by the Royal Horticultural Society’s judges following their visit to the village to judge last year’s entry into the South East in Bloom competition. Always nice to get a compliment – well done, team! The Compost Site is now closed until the 1st Saturday in April. Well, what a year that was! Shredder problems dogged most of it but I am glad to say that we have finally solved the problem of the wearing input belt by having it removed completely. We have done a couple of Saturdays without it and, although there is a little extra effort required to get stuff into the machine, it doesn’t seem to have had any great impact on the “throughput”. When I think back to the worst part of the summer when machine was out of action for about a month and the backlog reached its peak, I can’t believe how lucky we were that the weather was so good. For two or three weeks I was slicing a cliff face off the mountainous piles with my most powerful petrol hedge-trimmer to try to keep things moving – a bit like slicing a doner kebab! If those piles had got wet we would have been finished. The two receiving bays in the new “island” for the exclusive use of the allotmenteers have now gone over to “winter mode”. This means that there is no need to sort the material into shredding or soft but it would help if really big stuff like sunflower stalks of sweet corn stems could be chopped up a little. In the spring this will be moved into other bins in the island ready for the usual summer allotment arrangements to commence again. Please continue to observe the rules about not putting in clods of turf, soil, stones etc. I would also ask allotment holders not to put anything woody like fruit tree prunings or old blackcurrant or redcurrant stems in as these will not disintegrate sufficiently over the winter and will make emptying the bays very hard work in the spring. These bays will only take a little of what the allotments are capable of producing but we have to be realistic about what we can cope with and I would ask allotmenteers not to “overflow” them or put stuff in any other bin. More room will appear on the top of the bays as the waste rots down during the winter. We intend to replace another third of the composting bins over the winter break and (possibly) the main receiving bays. I think the improvements will then really start to make a difference both in the running of the site and its general appearance. Just a reminder that we are still looking for a little extra help for the fourth and any fifth Saturdays of the month. By the time you read this, the composting site will have closed as far as receiving green waste is concerned but will still be open until the last Saturday in October for anyone who wishes to avail themselves of our compost. During this time, the team will be up there preparing the site for winter and, maybe, the construction of more new bins to replace the old rotting ones if funds become available. The new “island” was completed at the end of August and includes two new receiving bays exclusively for waste from the allotments – one for “soft” material which does not require shredding and one for larger, tougher stuff which does. Please take a moment to read the notices next to the bays regarding what can and cannot be left there. We have had a couple of phenomenally busy Saturday mornings which have resulted in us having to organise mid-week shredding sessions. If we get the grant for the additional shredder we will be able to cope more easily next year but we have to accept that, however much shredding capacity we have, we could still be overwhelmed by demand. I will see how things go next year and may have to be more specific about how much can be brought to the site each Saturday. The latest thing to be renewed is the ramp which we can use to empty wheelbarrows directly into the compost bins if they are particularly heavy or if there aren’t two people available to lift the barrow, which is how we normally do it. The old one had become dangerously rotten and a bit of an eyesore. I would like to take this opportunity to thank our “extra” volunteers who each do one Saturday a month. So, thank you, Ruth and Jim Yeeles for doing the first Saturday, Elly Goodwin for doing the second and Ian Longley for the third. It is great to have your support and a real pleasure to see you each month. The fourth and fifth Saturdays are still looking for a willing helper. We are proud to show off our certificate of excellence from South & South east in bloom. ​The site will reopen on the first Saturday in April and the team having spent the past few Saturdays in preparation will be ready to receive the green waste and shredding from you at this time. These donations will go towards the cost of running the site for your benefit. I repeat my regular call for volunteers to come and assist on the site. There are many things to do some of them not strenuous in any way and your help would be appreciated. The composting site is run by compost volunteers aided by some allotment volunteers so do please be considerate to them by not dumping any material whilst we are closed and separate the waste you bring to the site for ease of transport to the correct bins. Details of what and when you can bring waste to the site can be found in the T.H.S. Year Book. ​Hopefully, by the time you read this, we will have sorted out the problem with the shredder. It has occurred to me that it might be a good idea if I had a way of contacting people who normally use the site to inform them if there is a problem so that they can avoid a wasted journey. I can understand how annoying it is to load up the car with your green waste and drive up to the site only to find that we cannot take it from you. So, if you would like to supply me with your email address I’ll be able to email you to advise you of any problems in advance. I do update the website but realise that most people probably don’t look at that too often. Now a little gripe. We have a dustbin just outside the compound in one of the corners. This is primarily for use by the composting team for disposing of plastic and other non-organic material that comes in the green waste. A couple of weeks ago we found a large amount of broken panes of glass in it. This is highly dangerous stuff and should be carefully wrapped in sturdy paper or cardboard even in your home bin. We certainly don’t want it in ours. A member of the team had to spend a good deal of time going home, finding a suitable box, then returning and finally taking it away. We don’t mind the bin being used for the odd bit of litter but please use it considerately. It isn’t collected from site and one of us has to take it home for collection there. Ending on a happier note, we would like to wish you all a productive summer in your gardens and an enjoyable holiday season!